On May 7, 1968, Sargent Shriver was sworn in as US Ambassador to France. Stepping into the oldest diplomatic position in US history, Sarge inherited both the proud legacies of Ben Franklin, John Adams, and Thomas Jefferson, all of whom had represented the confederation or the United States in France. 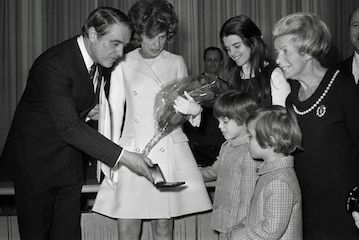 When Sargent Shriver arrived in Paris, the US relationship with France had been tense for several years, particularly after France decided to withdraw its military forces from NATO in 1966. France was also outspoken among Western powers in its recognition of Communist China, close relations with Eastern European communist countries, criticism of US policy in Vietnam, and the minimizing of the threat posed by Russia as a growing superpower. Upon arriving in Paris, Sarge walked right into the civil unrest of 1968—protests, riots, and police violence until French President Charles de Gaulle announced the dissolution of the national assembly. Given the fraught relationship that the US had with France and the precarious domestic situation in France, Sarge knew he would have to find a way to relate to the French. An opportunity to do so arrived two months after he was sworn in, when the Shriver family returned to Paris from Chicago in July following the inaugural games of the Special Olympics. Determined to continue the work she had been doing with children with intellectual disabilities, Eunice Shriver began working every Monday at External Médico-Pédagogique, a center for children with intellectual disabilities near the Shriver residence. In devoting themselves to such a cause, the Shrivers caught the attention of President and Madame de Gaulle, who had themselves had a child with Down’s syndrome, Anne, who had died at the age of 20. The two couples became close acquaintances and strong allies. Sarge was able to strengthen the bond between the two countries by aligning interests of France and the US. Both countries were dealing with domestic social unrest and the rising threat of the USSR, whose invasion of Czechoslovakia in the summer of 1968 had caused France to reevaluate its position with respect to the Soviet Union. Most notably, as the relationship with France grew warmer and warmer, Paris became the center of talks to negotiate peace and the end of the Vietnam war. Through the summer of 1968, Sarge met frequently with ambassadors Averell Harriman and Cyrus Vance, who were spearheading the peace talks on behalf of the Johnson Administration. By September it seemed that the diplomats had come to an agreement. Politics in the United States threatened the fragile negotiations. Sarge, in conversation with Harriman and Vance, discussed what peace in Vietnam could mean for the presidential campaign between former Vice President Nixon and Vice President Humphrey. If the Democrats could bring an end to the war, it would mean settling the unrest and securing new votes from anti-war constituents. Throughout the campaign, the Nixon camp maintained a secret channel to South Vietnam through Anna Chennault, an established Republican fundraiser at the time. There’s evidence that, when Johnson announced the first movements toward peace with withdrawal of American troops from North Vietnam on October 31, 1968, Nixon used his connection with Chennault to get South Vietnam to withdraw from the peace deal in a move that undermined peace and blocked the potential for a Democratic victory. Sarge suspected foul play at the collapse of the deal and made his accusations of Nixon publicly known. Though conclusive proof has never been found of Nixon’s direct engagement in sabotaging the prospect of peace with Vietnam, recently uncovered notes kept by HR Haldeman (who would later serve as Nixon’s White House chief of staff) indicate that the President had full knowledge of the act. After Nixon won the Presidential election in the United States, de Gaulle told Sarge he would be interested in hosting a visit from the new President on his European tour. During the President’s stay in France, Sarge played the role of liaison between the two leaders and ensured that their meetings, which got off to a rocky start, were characterized by joviality and open-minded discourse. Most notably, as a result of the meeting and Sarge’s deft facilitation, Nixon was able to open his ears to de Gaulle’s discussion of China, which played a substantial role in Nixon’s eventual renewed relationship with the Communist nation. See, for example, John A Farrell, “When a Candidate Conspired with a Foreign Power to Win an Election.” Politico, August 6, 2017.